Intelligent 3D printing is here. 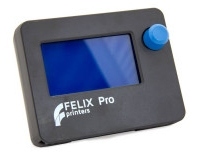 The FELIX Pro 3 builds on the success of other additive manufacturing platforms in the Pro range by introducing industrial-grade quality and reliability at an unmatched price point. The Pro 3 is an intuitive, intelligent and easy-to-use manufacturing tool for every stage of product development - from prototyping to production. It integrates seamlessly into the workflow of the office, workshop, lab or factory. 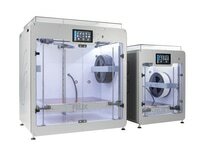 This 3D printer is handmade to order in our own factory in Europe. Our printers are enabled for modular upgrades in the future, ensuring an extensive lifespan. ✓ Two times faster dual head printing due to improved heat up times. ✓ Improved cooling for more detailed prints and damage-free object removal. ✓ Smarter control and monitoring with touch screen and webcam. ✓ Intelligent automated configuration for optimal ease of use. See below for detailed tech specs.